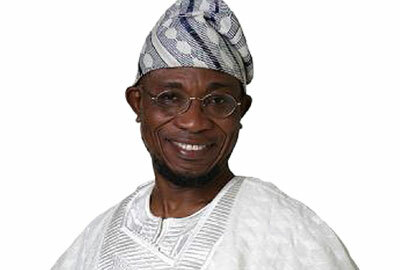 Osun State Governor Rauf Aregbesola yesterday swore in his executive council made up of 22 commissioners and 16 special advisers. The governor said he and his deputy, Mrs Grace Titi Laoye-Tomori, would drop their portfolios in Works and Infrastructure and Education for the new commissioners, to allow for effective policy coordination and supervision. Aregbesola, at the inauguration at the parking lot of Bola Ige House in Osogbo, said the ceremony was long overdue, but for financial constraint. The commissioners are Ismail Jayeoba Alagbada, Commerce, Co-operatives, Industries and Empowerment; Miss Mobolaji Akande, Human Resources and Capacity Building; Kolapo Alimi, Local Government and Chieftaincy Affairs; Mrs Mofolake Adetohun Adegboyega, Empowerment and Youths Development; Mr. Emmanuel Kunle Ige, Agriculture, Food Security and Youths Engagement; Dr. Surajudeen Bashir Ajibola, Attorney General and Commissioner for Justice; Mr. Bola Ilori, Regional Integration; Hon. Idiat Babalola, Commissioner for Federal Matters; Hon. Biyi Odunlade, Social Affairs Special Needs; Wasiu Kolawole Omotunde-Young, Education; Mudasiru Hussain, Cabinet Matters; Oguntola Mudasir Toogun, Special Duties; Idowu Michael Korede, Environment and Sanitation; Alh. Bola Oyebamiji, Finance; Mr Adelani Baderinwa , Information and Strategy; Mrs Latifat Giwa, Women Affairs; Engr Remi Omowaiye, Innovation and Technology; Dr. Rafiu Kusamotu, Health; Engr. Kazeem Aderemi Salami, Works and Transport; Dr. Dauda Yinusa, Economy, Planning and Budget; Dauda Adebiyi, Home Affair and Akintunde Akinajo, Lands and Physical Planning. The special Advisers are Hon. Samuel Adebisi, Special Adviser to the Governor Local Government and Chieftain Affairs; Barrister Mikail Adejare Adebisi, Special Adviser to the Governor on Special Projects, Office of the Governor; Barrister Gbenga Akano, Special Adviser to the Governor on Tax Matters; Hon. Ipoola Binuyo, Special Adviser to the Governor on Legislative Matters; Gbenga Oyinlola, Special Adviser to the Governor on Health Matters; Mr. Ayinde Olateju, Special Adviser to the Governor on Science and Technology; Mr. Ismail Adetoyese, Special Adviser to the Governor on Wealth Creation; Simeon Popoola, Special Adviser to the Governor on Commerce; Olajide Opatola, Special Adviser to the Governor on Environment and Sanitation; Tunde Ajilore, Special Adviser to the Governor on Natural, Mineral Resources; Claudius Kolajo, Special Adviser to the Governor on Agriculture, Food Security and Youth Engagement; Ademola, Special Adviser to the Governor on Public Production and Efficiency; Grace Oluyemi, Special Adviser to the Governor on Higher Education Bursary of Schools; Mrs Taiwo Oluga, Special Adviser to the Governor on Culture and Tourism; Olugebenga Awosode, Special Adviser to the Governor on Cooperative and John Ibirogba, Special Adviser to the Governor on Women and Community Affairs. Previous ROAD USERS GROAN AS IBADAN-IFE ROAD BECOMES DEATH TRAP! Next BUSINESS GONE BAD: Prostitute Stabs Custormer To Death Over “Service Fee” In Ogun!